March 20th. The Griffith High School basketball team from Griffith, Indiana, was on their way to the state semi final game. One moment it was a typical bus ride. The next, it was anything but. March 31st. Both the Woodville High School boys and girls track teams were headed to a meet when their bus’ right tires slipped off the road. None of them competed that day. April 6th. Members of the girls Algonquin Regional High School rugby team were one minute away from where they were to compete. 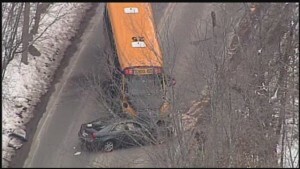 Then a car crashed into their school bus and sent many of them to the hospital instead. April 7th. 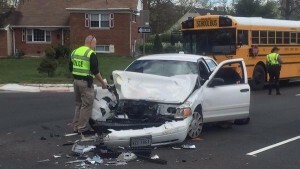 In Fairfax County, Virginia, a field trip ended with a trip to the ER for some students when their bus collided with a police cruiser. Thankfully, no children were killed in these crashes, but each accident had three other things in common: no seat belts, injured kids, and a school bus used for travel or activities was involved. Why is the latter important? Because school buses used for travel and activities are where districts should start with lap-shoulder belts. The above accidents are the perfect example why. These school buses often travel further and faster than most school buses in the fleet as they take students to sporting events, field trips, and other school activities. They often leave behind the slower, safer neighborhood streets to take to the highways and interstates where they’re surrounded by vehicles of equal or greater weight. These buses are more at risk for a significant crash, and so are the children riding them. Concussions. Broken bones. Back and neck injuries. All caused because compartmentalization, the main source of protection for your kids inside the school bus, is not enough. Buses need seat belts. Accidents like the ones above are frightening proof. Having said that, school buses are one of the safest vehicles your children can ride in, but SafeGuard lap-shoulder belts would make them even safer. We don’t mention these crashes to frighten you, but to educate you and districts like yours why travel buses are the best place to start with seat belts. When there are limited dollars for equipping your district’s buses, travel and activity buses make the most sense to start with first, because the most at risk deserve the most protection. These accidents have many of these districts revisiting the seat belt debate after they witnessed firsthand what happens without them. We wish it didn’t take a crash to make that happen. Be proactive. Speak up. Encourage other parents that it’s time to do something before tragedy strikes, not after. Tell your district it’s time for SafeGuard lap-shoulder belts on school buses.